The dialog is disappearing! I can't read it. (yawning) All things in existence are disappearing. That is one of the great truths of Buddha. But I can't read a damn thing! Even if the text were perfectly clear, most people can't read: their minds are too cluttered. Ugh? Why are we having this conversation? (half-jokingly) Aren't you having a good time? Should every conversation be like a reality TV drama? Do all comments need to be worthy of a tweet? Hey! This poem is about military recruiting. In my view, that is like marketing death. It is a crime. (shaking his head) Get realistic! As long as humans are in control of this planet, armed conflicts will emerge. And as long as there are are armed conflicts, there will be a need for soliders. Terri: The dialog is disappearing! I can't read it. Tim: (yawning) All things in existence are disappearing. That is one of the great truths of Buddha. Terri: But I can't read a damn thing! Tim: Even if the text were perfectly clear, most people can't read: their minds are too cluttered. Terri: Ugh? Why are we having this conversation? Tim: (half-jokingly) Aren't you having a good time? Should every conversation be like a reality TV drama? Do all comments need to be worthy of a tweet? Ted: Hey! 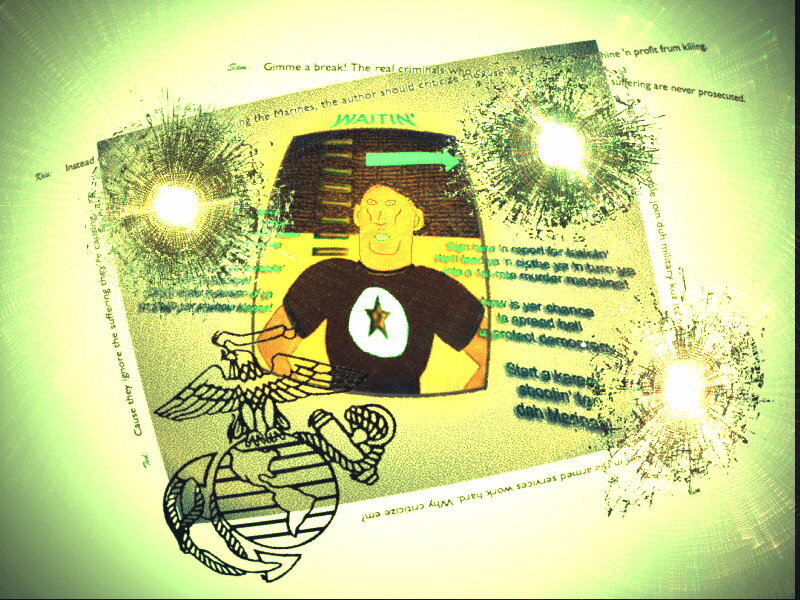 This poem is about military recruiting. In my view, that is like marketing death. It is a crime. Sam: (shaking his head) Get realistic! As long as humans are in control of this planet, armed conflicts will emerge. And as long as there are are armed conflicts, there will be a need for soliders.